South-facing villa overlooking lake and conservation area. Our home is fully air-conditioned and carpeted throughout. Situated in the quiet residential area of Kissimmee, our sub-division has its own security patrol, children’s play park, basket ball and tennis court. Enjoy watching the turtles basking in the sunshine on the lake shore or the variety of ducks which inhabit the area. It is a tranquil retreat from the bustles of an exciting day at the parks, sitting by the pool before exploring the local nightlife. Local amenities include a good variety of shops and restaurants along the 192 and Disney is only an 8 minute drive away. Welcome to our lovely lakefront villa in Kissimmee Florida just 8 mins from Disney and 15-20 minutes from most other attractions. We are a dual citizen family having been born in the UK but now reside in the USA. 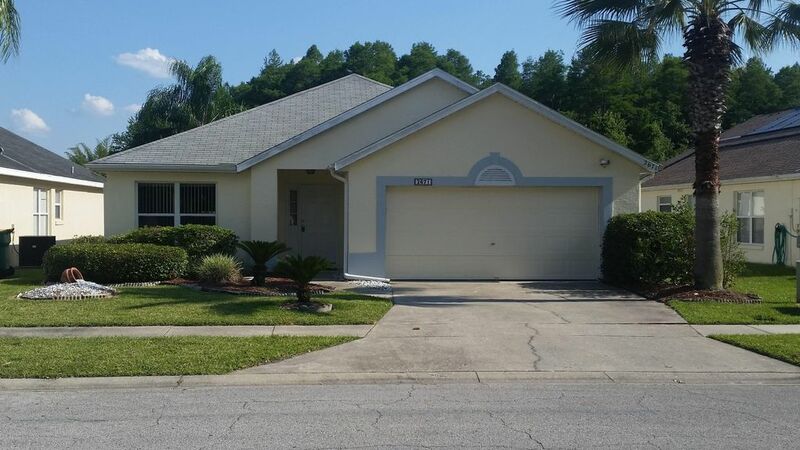 Great location to come back to after a long day at the theme parks or golf course where you can relax poolside with a beautiful lake front view. Less than a few minutes away from restaurants/grocery/pharmacy all of your needs are very close by. A great way to see Florida and all its attractions but come back to relax and enjoy some down time. The view over the lake with the backdrop of the conservation area with many locals birds, turtles, and fish to watch each morning and evening. Master bedroom has an en-suite bathroom with bath, walk-in shower, wc, vanity unit with basin and walk-in closet. Second bathroom serves bedrooms 2 and 3 and has bath, overhead shower, washbasin and wc. Family room has a 32” wide screen satellite TV and DVD, a three-seater sofa and one reclining rocking chair. The adjacent living/dining area has a full size dining table and chairs plus a three and two-seater sofa. Doors leading to private pool area. A fully equipped kitchen with breakfast table and chairs, dishwasher, electric cooker, waste disposal unit and fridge freezer with ice maker, plus a microwave, coffee machine, toaster and kettle. Outside: Our pool is south-facing and backs on to a lake and conservation area. We have no neighbouring back gardens and therefore are not overlooked. Solar heating is free, gas pool heating for winter months is available at an additional cost if required. Sun loungers and table and chairs are also provided for your relaxation. Utility Room: Garage laundry area with automatic washing machine, tumble dryer plus iron and ironing board. Cleaning / Towels / Linen / Maid service: All towels and linens are provided, included beach towels. Our villa is cleaned for you after your departure. Other: Broadband is available free of charge. A cot, high chair and baby car seat are supplied for the convenience of a young family. This is very nice property. Mike Hunter is a very good manager, easy to contact when we have questions. He is very quick to answer any concerns that we have. The place is very nice, great location. We field very save in the Chatham park. We have enjoyed the pool and also the lake with all kinds of different birds and we saw a alligator. We already booked the place for next year. Thank you very much. We had a relaxing time at Chatham Circle. The owners were so nice as to give up their Florida Xmas so that we could come! The villa was spotless and fully equipped, and Mike Hunter, the realtor in charge was so kind, nothing was too much trouble for him! The pool area and pool was great. And ... there was an alligator in the lake! We will certainly return! The house was beautiful and had everything you needed. Pool area and lake was great, spent a lot of time out there. Very convenient area and close to parks. Would definitely rent again. We have just come back from staying in the Villa, really easy to find from the airport and then easy to get in with the key box. The villa had everything we needed and was plenty big enough for the four of us. The only issue we had was the pool area really needs a good clean we spent a lot of time out there and in the pool but around the edges of the netting it was black and had plants growing around it, also ants around and we had to spray. I am sure if I contacted Mike he would of sorted it for us but we did manage to solve the problem ourselves. My son loved the wii and went in that a lot whilst the rest of us were busy getting ready. I am a keen runner and we ran around the complex some mornings which is a mile loop so got a couple of miles in for anyone else who runs, also went to the park run at Clermont which was great. The villa is in a great location about 10mins to Disney and 20/25mins to universal so again ideal. Longhorn steak house in Kissimmee is lovely and we went to Chilli’s as well which was very nice. As we arrived at the villa quite late it would of been nice if there was some milk left with some coffee for making a brew, just a small one would be a nice welcome for families. Overall loved our stay in the villa and would definitely recommend it. Thank you for having us. Thank you for your kind words and you are correct, had the small items been pointed out to Mike during your stay, they would have been addressed immediately as that is what he is there for. With regards to the welcome pack, we have no idea what time guests are arriving unless notified ahead of time by them, and as such, a welcome pack can be arranged easily. Hopefully on your next visit, we can assist as and when we are informed. Thank you for choosing our home. The fantastic white shores of the gulf are only about an hour and a half away - Clearwater, St Petes and Desoto. The Atlantic shores are closer with Coco Beach and the famous Ron Johns shop about 1 hour drive. Orlando International is about 30 mins drive and Sandford is just over an hour away. Car hire is recommended to get the most from your vacation. Booking Notes: A deposit of £150/$250 per week is required to secure your reservation. A security deposit of £150/$250 is required and is repayable 4 weeks after departure. Notes on prices: Prices are for the property per week in UK Pounds/US Dollars (including tax). Additional days are charged pro-rata. Special discount rates for stays of 3 weeks or longer.